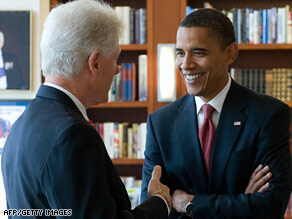 Bill Clinton and Barack Obama chat at Clinton's Harlem office. According to CNN's average of national polls, John McCain currently holds a 1-point lead over Obama, 46-45 percent. iReport.com: Still undecided? The poll of polls, released Thursday afternoon, is composed of the following five national general election surveys: Fox News/Opinion Dynamics (September 8-9), NBC/Wall Street Journal (September 6-8), American Research Group (September 6-8), Gallup (September 8-10), and Diageo/Hotline (September 8-10). It does not have a sampling error. Clinton is scheduled to campaign for Obama in Florida once he wraps up some business with his Clinton Global Initiative. According to aides, the former president will do a mix of fundraisers and public appearances on behalf of the Democratic ticket throughout the fall. CNN's Sasha Johnson, Dana Bash and Alexander Mooney contributed to this report.